We have been camping on the ice sheet for over a week now, and it’s amazing to think how familiar this environment now seems, especially compared to how foreign it felt when I stepped off the helicopter. – Water: you don’t have to carry a water bottle on a hike, just a cup. The water is the best tasting I’ve ever had. 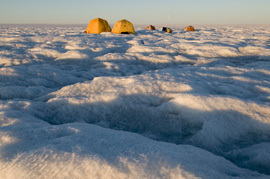 – Slippery tents: instead of using tent stakes to secure the tents, we use ice screws, which are 6-inch metal screws. The problem is, they heat up in the sun and melt out after a day, so we spend a lot of time repositioning the ice screws. – No night: this is a tough one—the 24 hours of daylight make it hard to sleep and it’s easy to forget what time it is. We also completed an hour-long helicopter survey of 20 nearby lakes. An aerial perspective gives you so much information that you can’t get from either the ground or from a satellite. You can see immediately the water level in a lake, count the number of inflow channels, and see where the lake is draining (if at all). The weather cleared during the survey and we had magnificent views of the glacial lakes – full ones, empty ones, and draining ones. On July 16, we disassembled our carefully constructed home at South Lake and packed everything up for a move to North Lake. 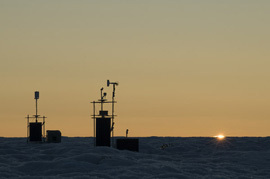 Although much of the work will be similar to what we did at South Lake (removing existing instruments, assembling new ones, and field mapping by foot and helicopter), the research team is expecting to see different processes at work here. Last year, South Lake drained through a huge downstream channel, while North Lake gushed through a gaping hole called a moulin right in the center of the lake. This year, new observations at South Lake confirmed that the water primarily drained through a huge crack that ran right through the lake. 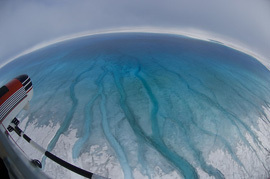 In the coming days, the science team is hoping to piece together this year’s story about North Lake, how it is similar and different from South Lake, how this knowledge can help to understand the thousands of glacial lakes that form on the ice sheet each summer, and what conclusions can be passed along to researchers modeling the global climate. Don’t forget to visit Polar Discovery to see daily photo essays!